News and Feature articles on this website are provided by Moore News Limited, Reg. No. 05108790. Established in 2003, Moore News Ltd is an independent provider of News and Features to major websites dealing in the Creative, IT, Freelance and Jobs markets. As well as supplying these areas, the founder and managing director has over a decade of experience in Local, National and Consumer Media. Your access to and use of Contractor UK ("the Website") is subject exclusively to these Terms and Conditions. You will not use the Website for any purpose that is unlawful or prohibited by these Terms and Conditions. By using the Website you are fully accepting the terms, conditions and disclaimers contained in this notice. If you do not accept these Terms and Conditions you must immediately stop using the Website. 5.1 All copyright, trade marks and all other intellectual property rights in the Website and its content (including without limitation the Website design, text, graphics and all software and source codes connected with the Website) are owned by or licensed to Contractor UK or otherwise used by Contractor UK as permitted by law. 5.3 If prior written permission is granted to feature an article first published by Contractor UK on an external site or publication, terms will be that only the first 150 words will be reproduced with a link to Contractor UK as the source of the article. The header, stand and copy must be reproduced exactly as published on Contractor UK, without altering, deleting or editing the content in any way. Contractor UK uses first-party cookies as part of the Google Analytics traffic analysis tool. Cookies do not identify people, but they are important in telling us how people use our site and how many visitors the site receives. You do not need to have cookies turned on to read and use the information on www.contractoruk.com. However, you do need cookies to participate actively in the forums. Additional terms of site use for the forum are here. 6.2 To the extent permitted by law, Contractor UK will not be liable for any indirect or consequential loss or damage whatever (including without limitation loss of business, opportunity, data, profits) arising out of or in connection with the use of the Website. 6.3 Contractor UK makes no warranty that the functionality of the Website will be uninterrupted or error free, that defects will be corrected or that the Website or the server that makes it available are free of viruses or anything else which may be harmful or destructive. 6.4 Nothing in these Terms and Conditions shall be construed so as to exclude or limit the liability of Contractor UK for death or personal injury as a result of the negligence of Contractor UK or that of its employees or agents. You agree to indemnify and hold Contractor UK and its employees and agents harmless from and against all liabilities, legal fees, damages, losses, costs and other expenses in relation to any claims or actions brought against Contractor UK arising out of any breach by you of these Terms and Conditions or other liabilities arising out of your use of this Website. 11.1 Votes are restricted to one vote in each category per voter. 11.2 Entries which are incomplete or incorrectly completed may be disqualified. 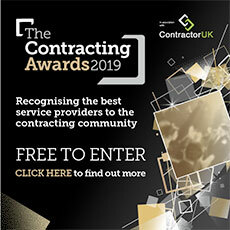 11.3 ContractorUK reserves the right to disqualify any entry which they consider, in their sole discretion, to be in breach of the Awards criteria. 11.4 ContractorUK’s awards decision is final and discretionary, no negotiations or correspondence with entrants will be entered into.